Top Round opens today and is worth a taste. Chicago slings the Italian beef, Western New York has the beef on weck, and here in L.A, we swear by the French dip. The roast beef sandwich is found in dozens of cities across the U.S. but no one has ever tried to enlighten us with a scalable, chef-driven version. Until now. 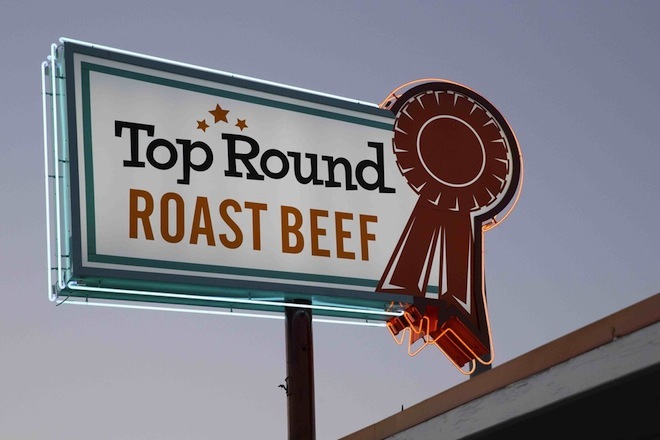 Today, Top Round Roast Beef opens on the corner of Olympic and La Brea, in a former donut shop, and the restaurant world is abuzz with news of the unique partnership behind this new concept. Top Round comes to us courtesy of chef 800 Degrees‘ Anthony Carron and Red Medicine’s Noah Ellis. Though the two partner with Umami Restaurant Group’s Adam Fleischman in their individual projects, Fleischman is not a partner in Top Round (“He’s been very supportive,” says Carron). Instead, Steven Fretz (Curtis Stone group), and Jamie Tiampo (an investor in several New York-based restaurants) are on board to help with everything from concept to execution and financing. Almost instantly we wondered: why would Carron, who’s about to go big with pizza, get busy with beef?